Jim Collopy was all in preflop holding [Kc][Kh] and was up against Anthony Gregg's ace queen. 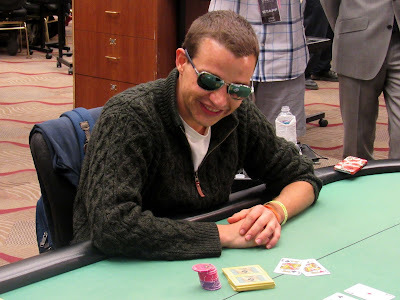 Jim was all smiles until the [Jd][6c][Ad] flop fell. Jim failed to find a king to save his tournament life, and he will exit in 9th place for $72,000.